I spend probably as much time thinking about mixing and how to do a better job at it as I do on actual projects. While I’m in a project, I’m always thinking about how I can improve my workflow, taking lessons I’ve learned and new ideas forward, solving problems, and adding new solutions to the toolbox; you know the drill. Because I’m a bit of an old codger, I’m also always connecting my work in the digital domain to work in the analog. “Thinking analog” as a way of getting better digital results. And mind you – I’m working 100% in the box now. Lately it came to me that one issue not uncommon to face is when I am working with marginally recorded tracks. And let’s make this even more challenging: Not only poorly recorded, but from a client who doesn’t want me using ‘replacement’ for whatever philosophical reason (I’m actually in that camp a lot of the time too, so I’m sympathetic to the thinking). I noticed in those situations that I was spending a lot of time massaging the sounds I’d been given into something strong as I went through my mixing workflow. While in the midst of this on a recent mix, a lightbulb went off in my head. Why do pro sessions sound “pro”? And I remembered the simple fact that when you start a recording session in a studio from scratch, the first thing the engineer does after the band sets up is get the inputs sounding good. She or he will select and move mics around, select the right preamps, do some initial EQing and compression… Basically get things sounding good. Everything sounds good? Cool – let’s record. Treat the audio like it’s live – start with some simple gain staging using clip gain, mimicking an input gain on a console. I thought: What if I “spend some time in the studio” before I mix the track? What if I look at all my inputs as if the band is in the other room and I’m setting up the track to record? What would the result be if I solo things out, fix what’s clearly wrong, and lock it down before I start mixing? Would that make mixing easier? Would that make the track sound better? As an experiment, I took a seat in the studio I had built in my head, with the imaginary band in the other room excited to roll on a take and played recording engineer. I picked a track on a project I remembered having issues with as a test. The drums on the track were a bit wonky and wanting, there were some honking guitars, and a bit of an uneven bass. After organizing the session, setting up my aux’s, submaster, submix, routing, etc., I started with the drums and worked my way up. Using some compression and EQ – in some cases like the kick, multiples of them, I got the set sounding close to where I would’ve accepted it in a real studio. Then I used Pro Tools’ “Commit” function to print the results. 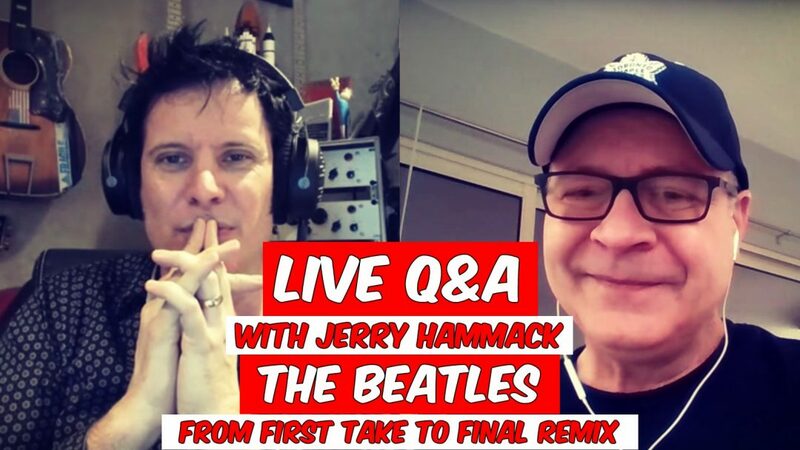 I followed the same process for guitars and keys and vocals; soloing and listening for the problems, correcting them, and printing the correction. The entire process took me a little over an hour (some tracks were just fine). Remember – I wasn’t mixing or even editing at this point: I was simply shaping the starting point of the sounds I would mix later. Using the “Commit” function in Pro Tools, I wrote the changes to the audio. The result of this exercise? The mix went much smoother. • You’re working with a good signal, already cleaned up, just like you’d get in a competent pro studio. 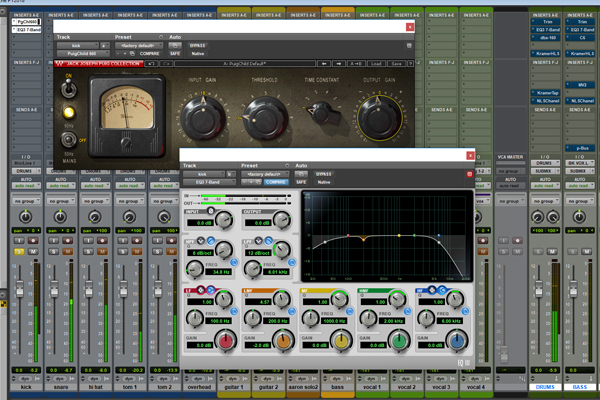 • You don’t need to use nearly the number of plugins you might have in the actual mix, because the one’s used to simply clean up issues have already done their job – the result was printed. Your coprocessor and RAM are free! • Because you are already making decisions as if you were the studio engineer on the session, you are also setting the starting line of your vision for the sound of the song – making a choice and committing it. Maybe most importantly, with this step out of the way across all inputs, you are able to focus on the mix and where you want to take the song for the artist. You are not being distracted by all the little things that can come up when dealing with challenging source material. Your creativity is set free. After committing my changes, the track is free of all processing once again and ready to mix. Once I had the basics down, I even tried some creative variations on this approach. With one, I used a very dry echo chamber to put a “room” on the tracks as I cleaned them up. Each input (except the vocals, because in my head the vocalist was in a booth!) got the same room (keeping in mind that how much of that room is on a close-mic’ed kick as opposed to an overhead or a guitar cabinet is very different), and this small addition of reflection brought the track to life – before I mixed it! I tried this out because I had remembered reading an interview with one of the old Capitol engineers from the 50s saying the sound of those recordings was predominately the sound of the room. I thought, why not make my own? So what if, with all my good intentions, I come back to the track and I’ve mucked it up? Well, don’t we all love the non-destructive nature of digital? I can just go back to the original track. Simple. I am lucky that in the majority of situations I get great audio to work with, but not always. With this method in my toolbox, I have a way to shine the best light on the music, even if what I’m starting with isn’t optimal. Could you spare an hour “in the studio” before you start mixing a track? Do you think it would save you some headaches down the road? Can you think of some creative extensions to this approach of your own? Are there pitfalls you can see with this approach that need to be avoided? Please share your thoughts and ideas, and as Warren always says, “have a marvellous time” while you’re at it!